Among the many things I do not like much, vampires & snakes feature pretty high up on the list. Sooo, I was not that excited to read this book. I mean, the two main characters are VERY snakesy. Both are poisonous, both have green eyes – no, not like yours, I’m talking bright green acidic tones – and Venom’s eyes even nictitate. What’s that you say? NIC. TI. TATE. Anyway, at this point you would be right in wondering how this all worked out so well, with me enjoying the book and rating it four stars. 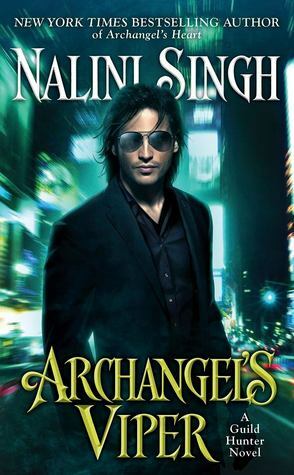 The answer dear friends is to trust in Nalini Singh, an empress of the parafanturban™ genre. Ten books into this series, and she has not lost any of her touch, once again silencing the naysayers , or as I like to say it, Pulling. It. Off. The Guild Hunter series possesses an overarching story line, but this element took a backseat as the story spotlight fell on Holly Chang aka Kitty (previously known as Sorrow) & Venom. Holly made a few appearances in earlier books, but last we saw her, she had become the sole survivor of the horror that was a Bloodborn-crazed archangel named Uram. Venom of course, is a member of the Seven, and whilst present throughout the series, he is still mostly an enigma, apart from all his snakelike abilities and his appearance. When these two are thrust together, heads and wills clash, sparks fly and entertainment ensues. The banter is heaps of fun and punctuates the whole enemies to lovers trope throughout the pages of the book. Apart from this brewing tempest of a romance, the main plot springs into action when bounty hunters try to kidnap Holly. The rhyme and reason is of course unknown, forcing the two main characters to work together to solve this mystery. As they try to peer into this rabbit hole though, they inevitably tumble down a path that lays bare both their pasts and the horrible events that shaped them, ultimately showing them that they are two sides of the same coin and also better and stronger together. This path though, also proves to be much deadlier than they ever anticipated. The Guild Hunter series is as strong as ever with Archangels Viper as it’s latest addition. Nalini Singh unfailingly delivered, striking a perfect balance between all the strands of this story she spun and giving Venom and Holly a worthy tale that will please all but the pickiest of fans.